Based in the heart of Canterbury's fashionable King's Mile district, our quaint, historic shop offers a wide range of luxury grade flowers. We also stock a selection of beautiful gifts. We're at 14 Palace Street, CT1 2DZ Just along from the Cathedral main entrance. It's a great part of town so why not take a stroll down the King's Mile to Palace Street and take a look? We're open Monday to Saturday, 9-5. Need some help and advice choosing colour schemes or display options? Whatever your need, we are here to help and our many years of experience will enable us to give you sound advice and maybe some fresh ideas. If you are able to call in, we can show you some ideas and give some inspiration. If you are unable to call in person, please telephone us on 01227 472154 or use the Contact Form to drop us an email. We recommend that Wedding, With Sympathy and Corporate flowers be ordered by phone on 01227 472154 along with any orders that require very specific flowers. Our reputation is built on our service, attention to detail, and understanding individual customers needs. 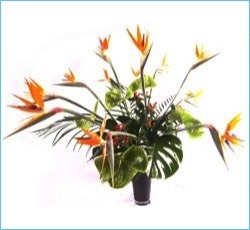 Some of our customers are floral experts who know exactly what they want and trust us to deliver! Other customers freely admit they don't know their gerberas from their roses and leave it to us to to create a display that perfectly suits their needs.